Norfolk Island (Norfuk: Norfuk Ailen) is a small inhabited island in the Pacific Ocean located between Australia, New Zealand and New Caledonia, and along with two neighboring islands, forms one of Australia's external territories. The Norfolk Island pine, a symbol of the island pictured in its flag, is a striking evergreen tree native to the island and is quite popular in Australia, where two related species also grow. Norfolk Island is a small territory with a small population that also played a brief role in the history of Britain's colonial activities in Australia. 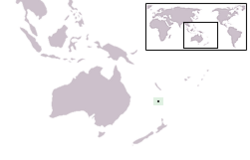 Norfolk Island is the main island of the island group the territory encompasses. It has an area of 13.3 square miles (34.6 square kilometers), with no large-scale internal bodies of water but 20 miles (32 kilometers) of coastline. The island's highest point is Mount Bates 1,047 feet (319 meters) above sea level, located in the northwest quadrant of the island. The majority of the terrain is suitable for farming and other agricultural uses. Philip Island, the second largest island of the territory, is located several kilometers south of the main island. The coastline of Norfolk Island consists—to varying degrees—of cliff faces. The island slopes downward towards Sydney Bay and Emily Bay, the site of the original colonial settlement of Kingston. There are no safe harbor facilities on Norfolk Island; loading jetties are located at Kingston and Cascade Bay. Goods are brought in by ship, usually to Cascade Bay. Emily Bay, protected from the Pacific Ocean by a small coral reef, is the only safe area for swimming, although surfing waves can sometimes be found in Ball Bay. Norfolk Island is a volcanic formation with mostly rolling plains. The climate is subtropical and mild, with little seasonal differentiation. The average daily maximum temperatures in winter range from 64 °F to 66 °F (18 °C to 19 °C) and 73 °F to 77 °F (23 °C to 25 °C) in the summer. Annual mean rainfall is 51.6 inches (1,312 millimeters), with May to August the rainiest months, and November to January the driest. The area surrounding Mt. Bates is preserved as the Norfolk Island National Park. The park, covering around 10 percent of the land of the island, contains remnants of the forests which originally covered the island, including stands of subtropical rainforest. The park also includes the two smaller islands to the south of Norfolk Island, Nepean Island and Philip Island. The vegetation of Philip Island was devastated due to the introduction of pigs and rabbits during the penal era. The major settlement on the island is Burnt Pine. Homesteads are scattered over much of the island. 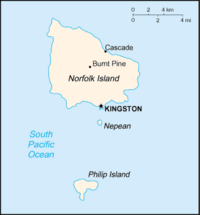 The island's official capital is Kingston, which functions mainly as a government center. Norfolk Island was first settled by East Polynesian seafarers, probably from the Kermadec Islands in the fourteenth century C.E., and who survived for several generations before disappearing. Their main village site has been excavated at Emily Bay. They left behind stone tools, rats, and banana trees as evidence of their sojourn. Captain James Cook was the first European to sight the island in 1774, on his second voyage to the South Pacific. He named it after the Duchess of Norfolk. Cook is said to have been impressed with the tall straight trees and New Zealand flax-like plants. He took samples back to the United Kingdom and reported on their potential uses for the Royal Navy. After the first convict fleet arrived at Port Jackson, New South Wales, Australia in January 1788 (Australia was intended to serve as a penal colony for the convicts of Britain), Governor Arthur Phillip ordered Lieutenant Philip Gidley King to lead a party of 15 convicts and seven free men to take control of nearby Norfolk Island and prepare for its commercial development, with the additional goal of preventing the French from colonizing Norfolk. The expedition arrived on March 6, 1788, establishing the first of two penal colonies on the island. The flax reported on by Cook was found to be difficult to prepare for manufacturing and no one in the group had the necessary skills. The pine timber was found to not be resilient enough for masts and this industry was also abandoned. More convicts were sent, and the island became instead the source of grain and vegetables for Sydney. However, crops often failed due to the salty wind, rats, and caterpillars. The lack of a natural safe harbor hindered communication and the transport of supplies and produce. Norfolk Island was governed by a succession of short-term commandants for the next 11 years. As early as 1794, King suggested its closure as a penal settlement as it was too remote and difficult for shipping, and too costly to maintain. By 1803 the secretary of state, Robert Hobart, ordered the removal of part of the Norfolk Island military, settlers and convicts to Van Diemen's Land (Tasmania), due to its great expense. By February 1814, all stock and buildings were destroyed and the island was abandoned until June 1825. A second penal settlement on Norfolk Island was ordered in 1824, as a place to send "the worst description of convicts." After a convict mutiny in 1834, Father William Ullathorne, the vicar general of Sydney, visited Norfolk Island. He was shocked "that each man who heard his reprieve wept bitterly, and that each man who heard of his condemnation to death went down on his knees with dry eyes, and thanked God." The 1846 report of magistrate Robert Pringle Stuart exposed the scarcity and poor quality of food, inadequacy of housing, horrors of torture and incessant flogging, insubordination of convicts, and corruption of overseers. Bishop Robert Willson visited Norfolk Island on three occasions. In 1846 he reported to the House of Lords who, for the first time, came to realize the enormity of atrocities. The second penal settlement began to be dismantled after 1847 and the last convicts were removed to Tasmania in May of 1855. On June 6, 1856, the descendants of Tahitians and the Bounty mutineers arrived at Norfolk Island. The Pitcairn Islands had become too small for their growing population. The Pitcairners occupied many of the buildings remaining from the penal settlements, and gradually established farming and whaling industries. Although some families decided to return to Pitcairn in 1858 and 1863, the island's population continued to slowly grow as the island accepted settlers, often arriving with whaling fleets. In 1867 the headquarters of the Melanesian Mission of the Church of England was established on the island, and in 1882, a church of St. Barnabas was erected. The mission was relocated from the island to the Solomon Islands to be closer to its target population in 1920. After the creation of the Commonwealth of Australia in 1901, Norfolk Island was placed under the authority of the new commonwealth government to be administered as an external territory. During World War II, the island was used as a key airbase and refueling location between Australia and New Zealand. As the island fell within New Zealand's area of responsibility, it was garrisoned by a New Zealand Army unit known as N Force. Norfolk Island did not come under attack. Norfolk Island is the only non-mainland Australian territory to have achieved self-governance. As a result of the "Norfolk Island Act," passed by the Parliament of Australia in 1979, the Australian government maintains authority on the island through an administrator (Grant Tambling in 2006) who is appointed by the governor-general of Australia. Legislation passed by the Australian Parliament can extend its laws to the territory at will, including the power to override any laws made by the Norfolk Island Legislative Assembly. On Norfolk Island, a nine-seat Legislative Assembly is elected by popular vote for a term of not more than three years. All seats are held by independent candidates, as Norfolk Island does not have political parties. Suffrage is universal at age 18. Four of the members of the assembly form the Executive Council, which devises policy and acts as an advisory body to the Administrator. The Legislative Assembly elects the chief minister for a term of not more than three years. The chief minister was Geoffrey Robert Gardner in 2006. The judiciary comprises the Supreme Court and the Court of Petty Sessions. The legal system is based on the laws of Australia, local ordinances, and acts. English common law applies in matters not covered by either Australian or Norfolk Island law. Though usually peaceful, Norfolk Island has been the site of two murders in the twenty-first century so far. In 2002, Janelle Patton, an Australian living on the island, was found dead. Two years later, the deputy chief minister of the island, Ivens "Toon" Buffett, was found shot dead, achieving the unlikely distinction of being the first Australian Minister to be murdered in office. Other than these two events, crime rates are low on the island, although recent reports indicate that petty theft and dangerous driving are becoming more prevalent. The most important national holiday is Bounty Day, celebrated on June 8, in memory of the arrival of the Pitcairn Islanders in 1856. As a territory of Australia, Norfolk Island does not have diplomatic representation abroad, or within the territory, and also is not a participant in any international organizations, other than sporting organizations. Despite the island's status as a self-governing territory of Australia, some islanders claim that it was actually granted independence at the time Queen Victoria granted permission to Pitcairn Islanders to re-settle on the island. These views have been repeatedly rejected by the Australian Parliament's Joint Committee on Territories, and were also rejected by the High Court of Australia. The Australian government undertook a review of the island’s status in 2006. Under the more radical of two proposed models proposed, the island's Legislative Assembly would be reduced to the status of a local council. Norfolk Island is subject to separate immigration controls from the rest of Australia. Tourism, Norfolk Island's primary economic activity, has steadily increased over the years. As Norfolk Island prohibits the importation of fresh fruit and vegetables, a vast majority of produce is grown locally. Beef is both produced locally and imported. Norfolk Island claims an exclusive economic zone extending 200 nautical miles (370 kilometers) and territorial sea claims to three nautical miles (6 kilometers) from the island. This zone provides the islanders with fish, its only major natural resource, though there is speculation that the zone may include oil and gas deposits. There are no major arable lands or permanent farmlands, though about 25 percent of the island is a permanent pasture. There is no irrigated land. The island uses the Australian dollar as its currency. Residents of Norfolk Island do not pay Australian federal taxes, creating a tax haven. Since there is no income tax, the island's Legislative Assembly raises money through an import duty. There are no railways, waterways, ports, or harbors on the island. Ships are loaded and unloaded by whaleboats towed by launches, five tons at a time at the loading jetties located at Kingston and Cascade Bay. There is one airport, Norfolk Island Airport. There are 50 miles (80 kilometers) of roads on the island, "little more than country lanes." Local law gives cows the right of way. As of 2004, 2,532 telephone main lines are in use, a mix of analog (2,500) and digital (32) circuits. Norfolk Island's country code is 672. Undersea coaxial cables link the island with Australia, New Zealand and Canada. Satellite service is planned. There is one TV station featuring local programming Norfolk TV, plus transmitters for ABC-TV and Southern Cross Television. The Internet country code top-level domain (ccTLD) is .nf. Exports totaled $1.5 million in 1991/1992. 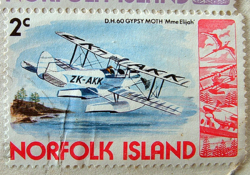 Export commodities included postage stamps, seeds of the Norfolk Island pine and Kentia palm, and small quantities of avocados. Export partners in 2004 were Australia, other Pacific island countries, New Zealand, Asia, and Europe. Imports totaled $17.9 million in 1991/1992) Import commodities were not listed. Import partners in 2004 were Australia, other Pacific island countries, New Zealand, Asia, and Europe. The population of Norfolk Island was estimated in July 2006 to be 1,828 with an annual population growth rate of 0.01 percent. Most islanders are of Caucasian ancestry, being descendants of the Bounty mutineers as well as more recent arrivals from Australia and New Zealand. About half of the islanders can trace their roots back to Pitcairn Island. This common heritage has led to a limited number of surnames among the Islanders—a limit constraining enough that the island's telephone directory lists people by nickname (such as Cane Toad, Dar Bizziebee, Kik Kik, Lettuce Leaf, Mutty, Oot, Paw Paw, Snoop, Tarzan, and Wiggy). The majority of islanders are Protestant Christians. In 1996, 37.4 percent identified as Anglican, 14.5 percent as Uniting Church, 11.5 percent as Roman Catholic, and 3.1 percent as Seventh-day Adventist. Literacy is not recorded officially, but it can be assumed to be roughly at a par with Australia's literacy rate. Islanders attend a school that uses a New South Wales curriculum, before moving to the mainland for further study. Islanders speak both English and a Creole language known as “Norfuk,” a blend of 1700s-English and Tahitian. The Norfuk language is decreasing in popularity as more tourists travel to the island and more young people leave for work and study reasons. However, there are efforts to keep it alive via dictionaries and the renaming of some tourist attractions by their Norfuk equivalents. In April 2005, it was declared a co-official language of the island. Emigration is growing as many islanders take advantage of the close ties between Norfolk, Australia, and New Zealand. The sole school on the island provides education to Australian Year 12. Therefore, any student seeking to complete tertiary study must travel overseas. Additionally, the small economy of the island causes many skilled workers to emigrate. Islanders are traditionally "outdoors" people, with fishing and other aquatic pursuits being common pastimes, an aspect which has become more noticeable as the island becomes more accessible to tourism. Most island families have at least one member involved in primary production in some form. As all the Pitcairn settlers were related to each other, islanders have historically been informal both with each other and to visitors. The most noticeable aspect of this is the "Norfolk Wave," with drivers waving to each other (ranging from a wave using the entire arm through to a raised index finger from the steering wheel) as they pass. Religious observance remains an important part of life for most islanders, particularly the older generations. Businesses tend to be closed on Mondays, for example. One of the island's residents is the novelist Colleen McCullough, whose works include The Thorn Birds and the Masters of Rome series, as well as Morgan's Run, set, in large part, on Norfolk Island. ↑ Nick Squires, Save our dialect, say Bounty islanders, The Daily Telegraph (19 Apr 2005). Retrieved January 13, 2012. ↑ Central Intelligence Agency, Norfolk Island, The World Factbook. Retrieved January 13, 2012. Norfolk Island and Its Inhabitants by Joseph Campbell, 1879. This page was last modified on 10 December 2018, at 16:31.